One of my fav quick meals is the Shanghainese cai fan, a pot of rice cooked with loads of veg. All you need to go with cai fun is a meat dish and a light soup, or you can even add some fried meat such as chicken or pork or Chinese sausages into the rice while it cooks and that's a meal. Another quick meal I like to do is the men tiao. This is home-made noodles made instantly, and cooks faster than dried mi fun. 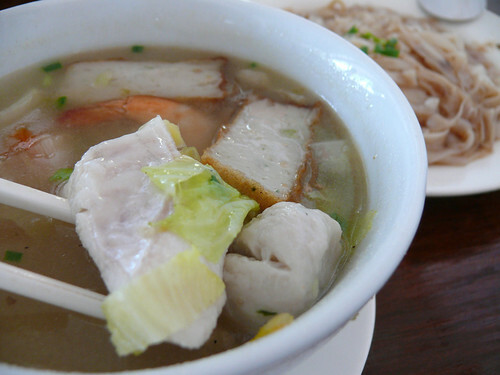 I like my men tiao cooked in chicken stock, with a couple of slices of fresh fish and some iceberg lettuce. Another version I like to do is men tiao with pork slices, pork balls, liver and sayur manis. One-pot rice casseroles are the easiest thing to cook if you are out of ideas/lazy/on a budget/all three. 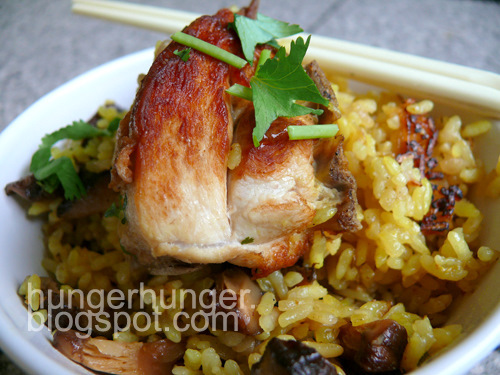 My fav rice casserole is of course dried Chinese mushrooms with chicken, flavored with plenty of soy sauce and garlic. Last week I cooked a coriander chicken rice casserole (a recipe from The Australian Women's Weekly) which was okay, meaning it won't give you lots of compliments. I'd make some changes to the recipe if I cook this again: I'd chop the chicken into smaller pieces and cook them in the stock to make the chicken moister and more tender. I'd also marinade the chicken and mushrooms together so they are better-flavored. 1. Marinade the chicken and mushrooms with the fish sauce, 1/4 t salt and some white pepper for an hour. 2. You can choose not to fry the chicken and mushrooms. Frying them will give better color and flavor. Just put about 1 T oil into your wok or fry pan and fry the chicken and mushrooms. When browned, add the marinade sauce and about 2 T water and cover, cook for 2-3 minutes. 3. Heat 1 T oil in a claypot or casserole pot, add the onions, garlic, coriander seeds and fry in low-medium fire for a minute. Add the rice and tumeric powder and stir well until fragrant, another 2 minutes or so. Do not burn the rice. If you are using an electric rice cooker, you now tranfer the fried rice to the cooker. 4. Top the rice with the chicken and mushroom (and any liquid) and add enough chicken stock so that the water above the rice is about 1.75 cm. 5. Heat the pot over the stove until rice boils, decrease the heat to low and let it cook another 10 minutes. Switch off and leave rice to finish cooking. 6. Sprinkle finely chopped (instead of cutting coarsely like I did) fresh coriander over the rice and serve hot. 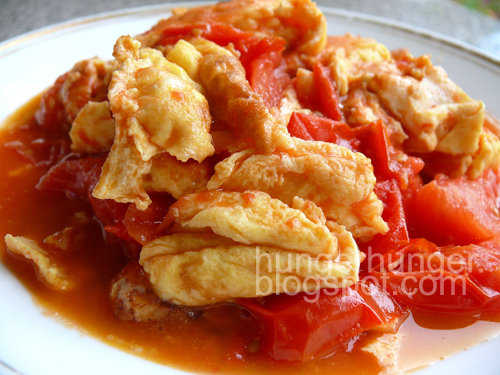 Tomato and scrambled egg has got to be one of the most common Chinese home dish. My mom's version is dryer with less tomatoes and the egg is thinner and less meatier. I prefer the version which I learnt from Hub's aunty in Shanghai because the eggs are fried into thicker pieces and soaked in a savory sweet tomato sauce. I thought I'd do a post on this since we had it for dinner tonight and since I've had requests for simple, easy to do dishes. 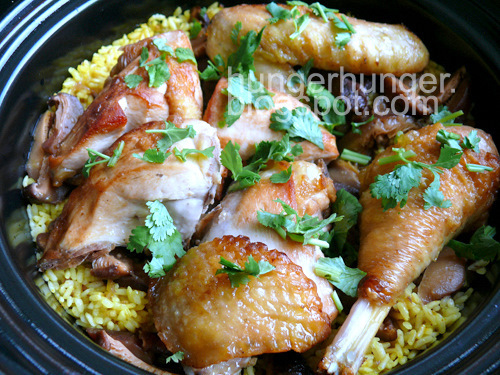 This is an inexpensive dish that cooks in about 5 minutes and is delicious with plain rice. If you love tomatoes (like I do) and eggs, you'll love this dish. This is so simple to cook that I have nothing much to say so this will probably be my shortest post so far. 1. Cut the tomatoes into wedges. Remove skin by putting tomatoes in hot water for a few seconds, then peel and slice into wedges. Remove the seeds but not too completely. It's traditional to remove the seeds and skin but now I don't do that because it's such a waste. Crack the eggs into a bowl, add 1/8 t salt and white pepper and beat with a fork or a pair of chopsticks. 2. Put about 1 1/2 T oil in a heated wok or you can also use a skillet. Make sure the oil coats all the sides of the wok so the egg won't stick. 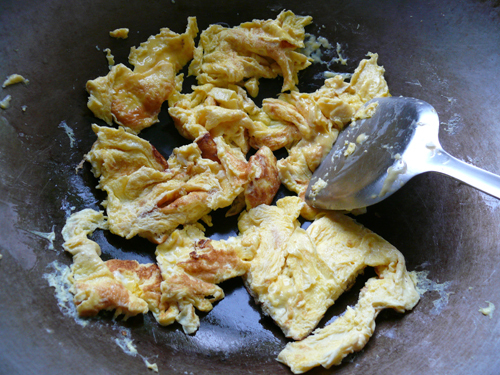 Pour all the egg into the wok, wait a few seconds (heat at medium) and tilt the wok so that the egg pancake is bigger but don't make it too thin; you want a meatier bite. When the egg is half set, turn over. It's okay to turn over section by section; the egg doesn't have to be in one piece. Using your frying ladle, cut the egg up into large pieces. Remove onto a plate. 3. Put 1 T oil into the same unwashed wok, add the tomatoes, the remaining 1/8 t salt, sugar (some tomatoes may be more sour and need more sugar) and the msg/chicken granules if using. 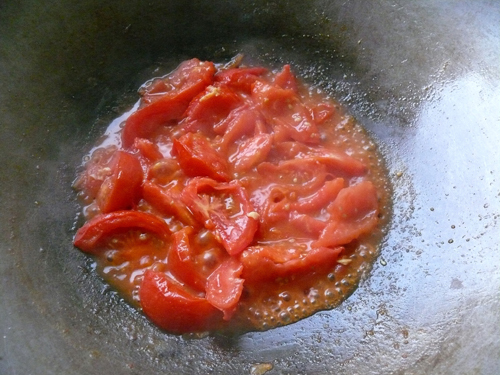 Fry under high heat, then when tomatoes are about half-wilted, add the egg, stirring well. Cover and lower the heat to medium-low and let simmer for 1-2 minutes to draw out the tomato juice and to let the eggs absorb the tomato juice. 4. Stir well so that the egg is fully soaked with the tomato liquid. If you like less sauce, increase heat to high so that the sauce dries up a little. Dish out into a deep plate and serve hot with plain rice. Beaufort and Tenom are towns on the west interior side of Sabah. These are towns where the Chinese Hakka immigrants settled in about 100 years ago. These towns have shrunk with the passing of the original batch of immigrants and their children and the migration of their grandchildren into the cities. Hakka food is simple, non-pretentious cuisine that centers on pork as the preferred meat: stir-fried veg with pork, pork mince stuffed tofu, boiled chicken, pork-egg rolls, stewed pork leg, cha sao omelette and so on. With the coffee, rubber and fruits orchards owned by small-holders replaced by mega oil palm plantations, many of the interior Hakkas folks have moved to the city and opened up coffeeshop-style restaurants that serve Hakka food. These are bright , florescent-lit, no-frills, no air-con-type of restaurants that serve 'home-style' food, mostly stirred fried to your order. You'd know them by their names: Beaufort or Man Tai. There are at least one in each residential area and they are always full, with families waiting for their tables on the 5-foot way. In Penampang, there are two I know of: Restaurant Beaufort and New Man Tai in Bundusan. R. Beaufort is always overcrowded and littered with used tissue papers on the floor and for that reason I hate to go there. I now totally avoid the place because the last two times after I had dinner there, I came down with stomach aches both times. I don't miss it anyway; the food has gotten really bad, with shrinking portions and food so gluey you can mend your shoes with it. My fav Hakka 'home food' restaurant is New Man Tai at Bundusan. It is less congested, the place seems cleaner and the food is marginally better than the other similar restaurants. That was my impression. Last Sunday, we were there for a quick dinner and I was surprised to find that it was rather expensive and the food lacked its trademark wok hei (heat of the wok). Overall, the food too was gluey and I realise that this glueyness is the other trademark of these Beaufort-type of restaurants. Fried noodles, Tenom-Beaufort style. RM5.50/US$1.50 per small plate . Wey couldn't finish this. He said Restaurant Beaufort's noodles are better. Bittergourd with beef and black beans, RM9/US$2.50 for small portion. Done pretty well except for the beef which had so much bicarb of soda as tenderizer it didn't have any beef flavor left. But then, that's always how beef is treated in Chinese restaurants--with a lot of bicarb of soda, because they use cheap tough cuts of beef. 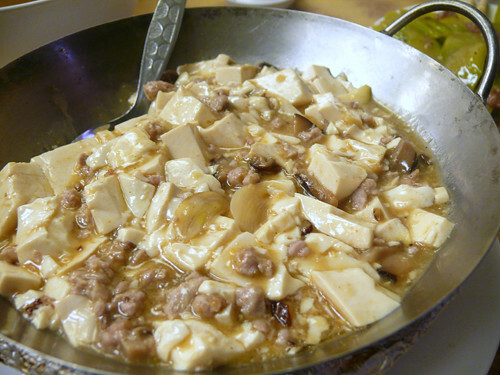 Tofu with minced pork and mushrooms, RM11/US$3.80 for small portion. Used to be better. 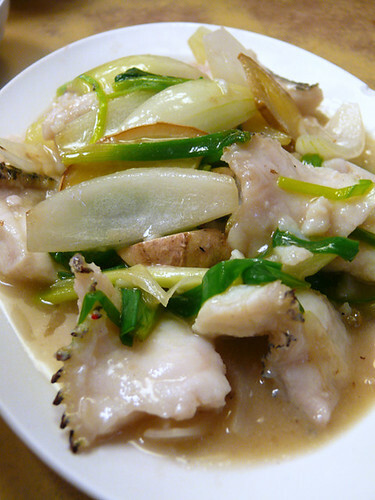 Fish with ginger and spring onions, RM16/US$4.40 small portion. Expensive! There were only about 10 small slices of flavorless fish. Including the soup of the day (winter melon soup) and 3 plates of rice, the bill was RM61.40, not cheap for simple home-style food methinks. I came home with my mouth dry and numb from the msg in the food, a common feeling after eating at Beaufort/Man Tai restaurants. Msg is the life saver for Chinese restaurants. The stuff can spike up the savory sweetness of food especially if the ingredients are not fresh or of good quality. One tiny pinch of the stuff can enhance a whole plate of greens but many restaurants use it like they use salt and you can actually get used to it if you eat out often. New Man Tai is next to Supertanker Restaurant, Jalan Bundusan, Penampang. Westlake vinegar fish. Double the amount of sauce if your fish is big. Here, I didn't have enough sauce and instead left half the steamed liquid on the plate--not very presentable. When I was about 16, my oldest bro came back from college in Hong Kong where he had a Shanghainese girlfriend. He told us that he noticed two distinct things about the Shanghainese: their food is black from all that soy sauce and they have higher and sharper noses than us Cantonese. That made me check out every Shanghainese's nose, and unfortunately for them, I disagree with my bro's observation. Longer, just slightly longer noses, yes, but not any taller than the average Cantonese nose. Staturewise, however, they tend to be taller. But bro was right about the color of their food though. 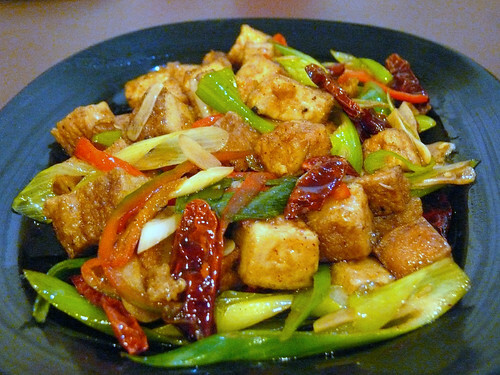 While Cantonese food is colorful with fresh ingredients, Shangainese food tend to be a boring brown-black, simmered and stewed in soy sauce, wine and sugar--the famous 'red-cooking'. 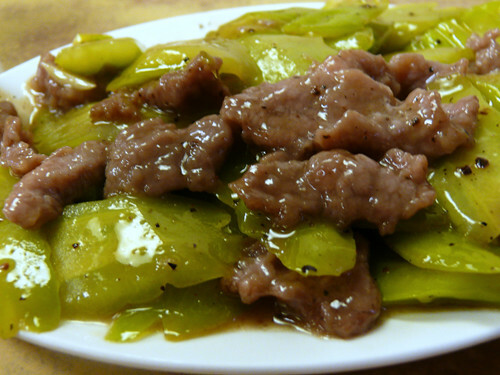 However, I have to admit, color is deceptive and nobody red-cooks and braises and stews better than a Shanghainese. The Cantonese way of cooking sweet and sour fish is to deep-fry the cornstarch-coated fish and blanket it with a sauce made of tomato ketchup, white vinegar and sugar, with some colorful veg thrown in. I find the white vinegar and ketchup too sharp, and so this is my least liked way of cooking sweet and sour fish. 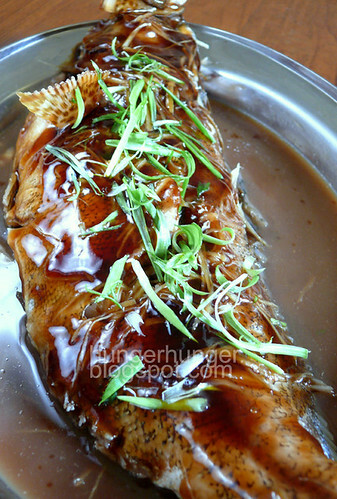 The Shanghainese way is to pan-fry the fish and finish the cooking with ginger, soy sauce, sugar, wine and black vinegar. The combination works very well except I find it a little too sweet. Hangzhou, a city 2 hours by car from Shanghai, is famous for several dishes and one of them is their Westlake vinegar fish, which uses similar ingredients as the Shanghainese vinegar & sugar fish, but the fish is poached, making the flesh softer, moister and less oily, perfect if you don't want to fry, and then, a sweet sour sauce is poured over it. I kid you not, this is one really yummy way of cooking sweet and sour fish. It's so good I prefer it to the Shanghainese sugar vinegar fish, and even my MIL agrees. I've simplified the recipe for home cooks. Do you know that most restaurants poach instead of steam (but they'll tell you the fish is steamed) their fish? Poaching cuts down on the cooking time. The water the fish is poached in is probably seasoned to the point of becoming a fish stock since they poach so many fish. Hangzhou vinegar fish is usually poached but I prefer to steam it; saves the trouble of lifting the fish out from the water. We don't get good freshwater fish here, unlike in China where all the fish they eat are from rivers and lakes--Westlake is the most famous lake in China (I think. I'm not a sino expert) although all I remember of it was mist, mist, mist-- and are surprisingly flavorful and tasty,whereas the ones we get here taste of mud. Which is why we prefer salt water fish although in terms of flavor, good fresh water fish is better. The best fish to get for this recipe, if you can't get a good fresh water fish, is fine-fleshed fish like the perch, bass, barramundi etc of about 800g to 1 kg. Grouper is good too but it should be less than, say, 1.5 kg. Don't get filletted fish. Chinese prefer their fish whole, bones on, probably because chopsticks are the perfect tools for picking at the fish . I find filleted fish boring to eat. Besides, deboned fish is for sissies. * update 18/11/10: after my recent trip to Hangzhou, I realize that the fish must be butterflied to minimize the cooking time so that the flesh is tender. The fish will also look bigger when butterflied. 1. Remove the scales & clean the fish. If fish is thick, butterfly it. Make a couple of slashes on the thickess part of the body to help fish cook faster. Put the fish on a heat-proof plate and scatter ginger strips under and over the fish. Pour the wine all over the fish. 2. Steam the fish for 10-12 minutes depending on the thickness of the body. Test with a fork by flaking the thickess part of the body. If it flakes off easily from the bone, fish is done. Do not over cook. 3. While fish is steaming, put all the sauce ingredients (except for the cornflour and water) into a small pot and cook over low flame, stirring to dissolve the sugar. When sugar is dissolved, add 1 cup chicken stock*/poaching water to the sauce. When sauce boils, add the corn flour solution and stir well until sauce becomes shiny and thickened. Taste and adjust with more sugar or vinegar or salt to your liking. 4. Add a splash of sesame oil (if using) to the thickened sauce and pour it over the steamed fish. Sprinkle the fine spring onions strips on the fish. Serve hot. *Note step 3: You can use the liquid from the steamed fish instead of the chicken stock but it may be fishy & also turns the sauce opaque instead of shiny & clear. As the readership of this blog grows, it gets harder for me to share my personal life. It is not 'cool' . But I think it is a blog first rather than some kind of professional publication. I don't want it to become some snob blog. I realize that I am a worrier. I worry and worry and assume the worst so that when the worst is not as worse as I had imagined, I feel better. Three weeks ago the doc said that my mom (who is now living with me, after a hypoglycemic scare in early March) needed further tests; she had blood in her stools and she was loosing weight. All my other problems pale in comparison. I thought how stupid I was to not appreciate simple things like watching TV with my family (instead of blogging) and sitting out with a cup of coffee when the weather's cool. I felt how brief and precious life was, and how I take it for granted. I think unless you are in a position where life can be touch and go, you will not fully appreciate it. I even felt depressed, and I thought maybe I should just give up blogging too because suddenly it wasn't fun anymore, in light of the seriousness of the situation. But I prayed and hoped that God will let me have my mom for many many more years. Wey realized how anxious I was and for once passed his BM test because he knew that would make me happy. Oh, the human penchant for complacency and the need to be shaken now and then. I also realize that I've been living for the future. My future is 'when my kids graduate, when Wey gets into uni, when my dream house is completed, when Hub is retired, when we can pack up and go around the world'. When, when, when. If you are reading this, and you are facing some problem that is not life-threatening, let me tell you to be happy, look at things differently, positively, gratefully and hopefully. When I was young, I prayed the hardest when I wrote a bad exam because that was what matters the most for me then. In the last 10 years, my hardest and most earnest prayers were for family and friends. Other times I'm a 30-seconds prayer person. Make that 60 seconds just in case my church friends are reading. Like what many others have said, that on their deathbeds, nobody regrets the loss of a business deal or the dream Mediterranean cruise or the movie star career. Most deathbed regrets are about estranged relationships. Just thought I'll share with you how I'm feeling. If there's somebody you love, let them know. And be kind to them while you can. All the little squabbles, the little irritations, or even the big ones, they don't matter. If you love, and are loved, thank God and be grateful. That means showing them, not just saying it. For me, showing love can be holding back my tongue; I'm learning to be nice. p.s the results are back. My mom has a non-cancerous ulcer in her colon. She is recovering. I know because she is asking silly irrelevant questions and started snooping in my kitchen (she just broke a tiny porcelain plate Yi had bought for me from Dresden, Germany, teaching/forcing me to let go of material things...). Most of all, she wants to eat everything, so I know she's back to normal. As for me, I'm my old self. Somebody jumped the line at the Foh San traffic lights yesterday. Too bad for the fella, because of all the cars, he chose mine to squeeze in front of, so I fought him inch by inch until he gave up. I just won't allow people to jump the line like everybody else can wait but not them. No manners. Imagine eating a piece of the fattiest pork belly that has been braised and steamed in a soy and wine sauce for 4-6 hours until it barely holds together. What you need is courage, and an Anthony Bourdain kind of reckless passion for food. I failed the Dongpo pork test, twice. The first time I encountered the real thing was in Hangzhou, in 1999. We were on a 9-day tour of the Zhejiang and Yangze Delta region of China which include famous classic Chinese cities like Suzhou, Wuxi, Hangzhou, Nanjing and Shanghai. And Beijing, because that was our entry point. At each of these cities, we were served the local specialty. In Wuxi, it was Wuxi pork ribs (sublime!). In Hangzhou, it was Dongpo pork. The waitress placed a small bowl covered with a lid in front of each of us. As each person took the lid off, the reaction ranged from dismay to disgust and all of us put the lids back on, refusing to eat the piece of fat in the bowl. All, except one guy at our table of 10. He took a pair of chopsticks and lifted a tiny morsel of reddish-brown wobbly skin and fat and slipped it into his mouth. He closed his eyes, shook his head slowly and went, "Oooo..". Back his chopsticks went, picking on the piece of fat and skin with pleasure, while in between mouthfuls he teased us about missing out on the most heavenly dish ever cooked. To this day, I can remember that piece of Dongpo rou. It was a square piece of braised pork fat and skin, nothing less. There was only one thin layer of meat, about 2 mm, that ran horizontally across the fat that was about 5 cm high. 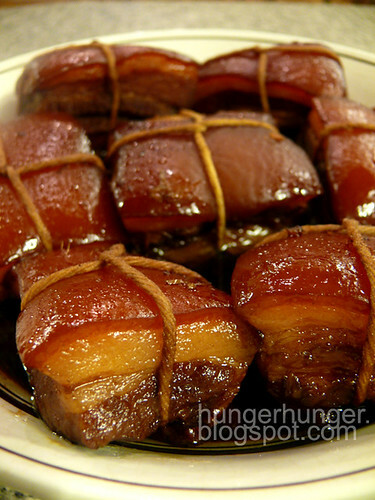 Only the fattest pork belly is suitable for cooking dongpo rou because Dongpo rou is all about eating the fat, not the meat. It was food shock for us. Su Dongpo was a great Chinese poet who lived about 900 years ago. Born in Sichuan but famous for his work as a govenment officer in Hangzhou, Dongpo came from a family of highly educated parents and siblings who were all poets. Dongpo not only waxed poetry, he apparently could cook too because he is credited for creating Dongpo rou (Dongpo's meat), one of the most famous dishes in Hangzhou. 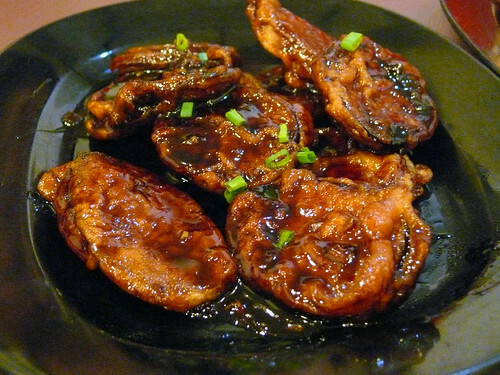 Apparently, Dongpo came up with a revised version of hong shao rou (red cooked meat), a dish that is to the Shanghainese as Yorkshire pudding is to the British. Basically what the guy did was instead of putting the meat into a pot of boiling soy sauce, sugar, spices and wine as is done in red cooking, he took the extra step of caramelizing the sugar and frying the meat in it before stewing it in the pot of soy sauce mix, then steaming it for hours until it melts in the mouth. By doing that, the reddish-brown color of the pork comes more from the caramelized sugar than the soy sauce whereas in red-cooked meat, the color is from the soy sauce. The longer you stew or steam the meat, the less oily the pork is said to become because the oil will seep out, leaving the de-oiled fat, if that makes sense, so that the Dongpo pork doesn't feel or taste oily even if you eat the fat. To me, the fat didn't feel that oily because it wasn't like fat anymore. It was so soft that it melted on my tongue. 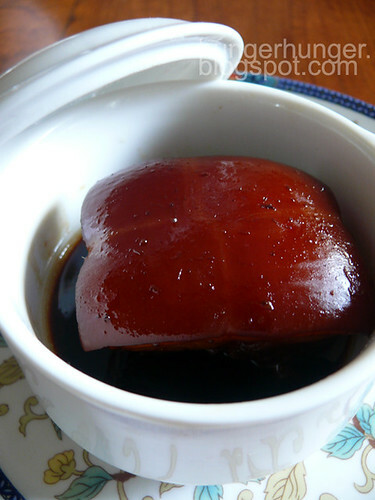 But with great humbleness, I think Dongpo should've deep-fried the pork skin, then braised and steamed it. I'm referring to the canned Maling brand of super delicious stewed pork belly with the crinkly skin that is banned in my house because it's all skin and fat. Anyway, I've satisfied my curiosity about Dongpo rou, so I can now move on to the next food adventure. If you have the stomach for it, literally, try it at least once in your lifetime. I bet that Dongpo must've died of a heart attack. The pork cubes before steaming. 1. Pour boiling water over the cleaned pork belly in a bowl to remove any smell and dirt. Drain, cut the pork belly into 7 cm squares. Tie each piece of belly with the string so that the meat keeps its shape andstays intact. 2. Put the oil into an unheated wok and add the sugar, cooking over low heat until sugar has dissolved. Add the pork and stir well until the sugar turns yellow. Turn heat off. *The Dongpo pork flavor depends very much on the quality and flavor of the soy sauce used so be sure you use one that's good. 4. Add the pork pieces & sugar syrup into the boiling sauce, reduce the heat to low and let it simmer for 1 1/2 hours. You can adjust the seasoning of the sauce at this point but remember that the sauce will thicken and be saltier. 5. Put the pork pieces and sauce into a big heat-proof bowl or dish and steam for at least 3 hours. If kept overnight at this point and re-steamed for another hour or more the next day, it's even better. If the sauce is thin, pour it into a small pot (without the pork) and heat it on high to evaporate and thicken it. Pour the thickened sauce over the pork pieces to serve. I have little knowledge of Xinjiang food and I've only tasted Xinjiang bbq kebabs (yummy) and bbq brinjals at little streets stalls in different parts of China. If you see medium-fair-skinned fellas with Muslim skull caps looking like Pakistanis and they are selling bbq meat or even pelts, you can be sure he's from Xinjiang, which is an autonomous region of China, like Tibet. And don't talk to him in Urdu because he can speak better Chinese than you although he'd try to pretend he doesn't. The predominant spice used in Xinjiang food seems to be aniseed (which is different from star anise) and cumin and not chili powder. The preferred meat is mutton. Like I said, I haven't tasted much Xinjiang food but I think I'd love to visit their capital Urumqi and taste their kebabs, roasted mutton, hand-pulled noodles, bread and whatever else they have. But I will not drink their goats or yak milk tea. Ew. Moon Bell is the only Xinjiang restaurant in KK, the other one in the Waterfront having closed some time ago. Shan loves the place, and when I got to the restaurant last Saturday, Karen the restaurant owner said Shan had just left with a bag of 'stormsand chicken'. Shan has been raving about that dish. 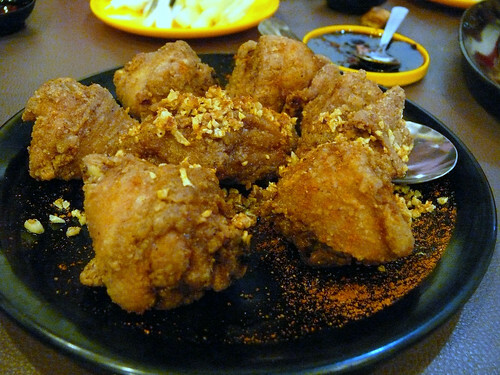 I was torn between the first item on the menu, da pan ji (big platter of chicken), which is one of Xinjiang's most famous dishes, and the stormsand chicken. (I wonder if they mean sandstorm, seeing that there's deep fried crispy garlic and paprika scattered all over the plate.) In the end, I ordered the stormsand chicken. It came straight from the fryer, crackling hot. The cumin -flavored coating was crispy and fragrant and the flesh was moist and tasty. I love this too, Shan, and I'm going to make some myself. At RM15/US$4, there were only 7 pieces of chicken, not exactly expensive but not cheap either. 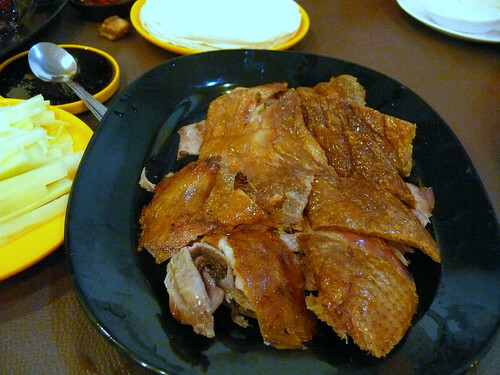 This is a half portion of Peking Duck looking like a quarter portion, RM35US$10. A full portion is twice that price. Traditionally, Peking duck is served 3 ways: firstly, the skin is served with wheat flour pancakes, then a second dish of stir- fried shredded duck meat and lastly a soup made from the bones. Moon Bell does this as well, but not for the half portion. Bummer. Peking Duck is a fancy dish, served with fanfare in restaurants that bother to have it on their menu. Even if it isn't given its superstar status, like in King Hu, it should at least look like Peking Duck, with reddish-brown shinny crispy skin. Moon Bell's version looks more like Shanghai crispy pepper duck (which Hub's aunty cooked for us on a visit here 18 years ago; another post). The skin was crispy and the meat dry (unlike Peking Duck) but it was quite tasty so if I were Karen, I would re-name this duck Xinjiang duck or something because it just isn't Peking duck and customers will not be impressed. And I would definitely give a second dish for the half portion. And make the half portion half, not quarter. My in-laws had the hand-pulled noodles but I didn't take any photos of that. I did, on a whim, drop by again the next day to try the noodles but this time I'd left my camera home. I wouldn't recommend the noodles. The noodles portion was very small (a handful) and there were only 4-5 paper-thin slices of beef that were each as wide as my thumb. The noodles were el dente but other than that, just like the soup they came in, they weren't special. For that, you have to pay RM10 per bowl. Moon Bell's Xinjiang dishes are a refreshing change from the usual Cantonese food in most of our Chinese restaurants. I like that they cook the food upon order so every dish comes hot and fresh but some items may take a while. 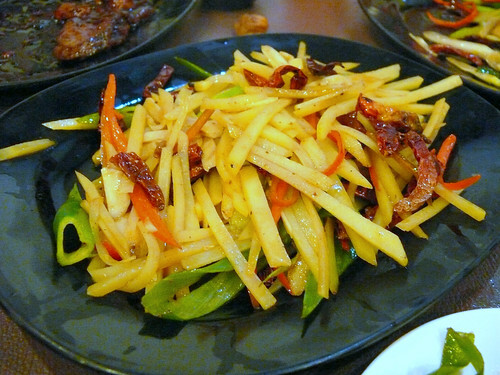 The restaurant is casual and the dishes are not suitable for banquet-style dinners and people/in-laws/old folks not used to anything but local Chinese food and so the place is best for a casual meal. While the prices seem inexpensive, the portions are not big either. 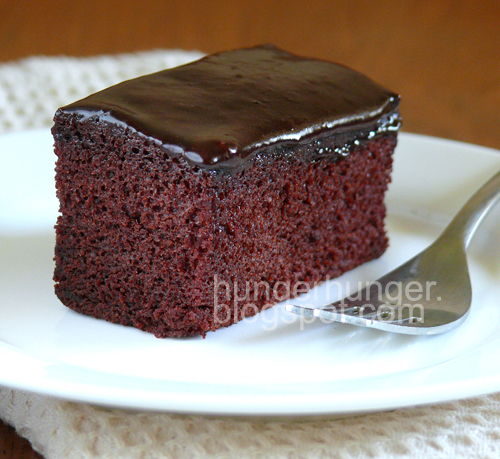 Hershey's Black Magic Cake, easy to make and to eat. In my experience, the best cake recipes are those given by people whom you can trust. I have tried many cake recipes from food magazines and the net but nearly every try was a disappointment. I forgive (but not forget) too easily though and gave in one more time, this time to Hershey's Black Magic Cake. 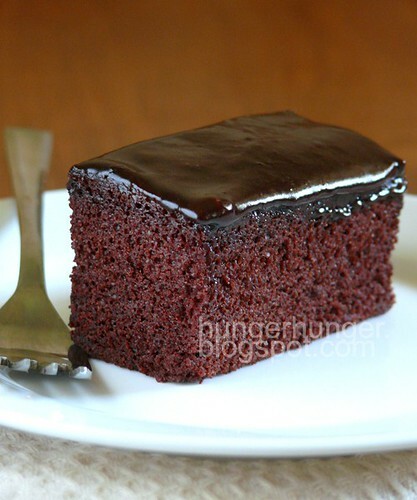 I don't know which came first, this cake or the others that are similar to it, like the Red Velvet Cake, for example, but if you bother to check, many cake recipes out there on the net use the same ingredients and amount as this cake with only the flavoring ingredients substituted. This will be a great basic cake on which to develop other cakes because the texture of the cake is soft and moist, and all the ingredients are thrown into the mixer bowl; you don't have to separate the eggs. You just mix everything together. In one bowl. The end result is a cake that will surprise you, pleasantly. I really thought that the cake would turn out hard and dense because the batter was very watery. It was like unwhipped cream. I also had reservations because I reduced sugar by half a cup, baking soda by 3/4 teaspoon because I dislike the smell and salty alkaline taste, and salt by 3/4 teaspoon for health and taste reasons as I figured that the reduction in salt would balance the reduction in sugar. I also substituted 1/2 the veg oil with melted butter. Just thought that butter would taste better, yet didn't want to go all the way to make this a sinful black magic cake. So with all those changes, I just wasn't sure if the black magic was going to work. Hershey's spell was too good to be broken because my trimmed cake turned out fine.The texture of this cake is soft without being airy like a sponge or chiffon cake, and crumbly without being dry. I think the texture is nearly like some cake mixes but the taste is way better. Even the color is beautiful-- a rich dark brown. I wonder if other cocoa powders give the same color. The only thing I didn't like was the frosting, which I took from Pioneer Woman's post on choc sheet cake. (I did make it a sheet cake which is an excellent way of serving an informal cake. Southern US in origin, sheet cakes are cakes baked in a shallow tray or pan to give a one-layer cake .) I used PW's recipe because it calls for cocoa powder instead of block choc which is convenient and cheaper, and also there's no need to bring out the mixer; you just hand-whisk everything over the stove. However, I found the frosting too much like glace icing and although I reduced the sugar (and the butter and replaced the milk with cream), the frosting was too sweet, slightly gritty and tasted like a sugar, choc powder and milk mix. Which it was anyway. It just wasn't creamy and smooth enough and didn't do anything for the cake. The next time I do this cake, I will take the trouble to get some choc chips and make a ganache. If you've never made a cake before, start with this. Make it a sheet cake. 1. Oven at 180 C. Grease and flour two 9" round cake tins for making a layered cake. You can't use one tin and cut into 2 horizontal layers because the cake is crumbly. I doubled the recipe and used a 33 cm x 33 cm x 2.5 cm high (13" x 13" x 1") cookie sheet to make a sheet cake. Use a slightly higher tray if you have one. 2. Sift the cake flour, baking powder, baking soda and cocoa powder together into a mixer bowl. Add the rest of the ingredients and beat at medium speed for 2 minutes. 3. Pour into the prepared tray/tins and bake 30-35 minutes for the round tins and40-45 minutes for the tray until a wooden skewer inserted into the center of the cake comes out clean. 4. Cool and pour a choc topping/ frosting on top. I recommend a choc ganache. What a special gift, Louis & Jasmine. I am touched. 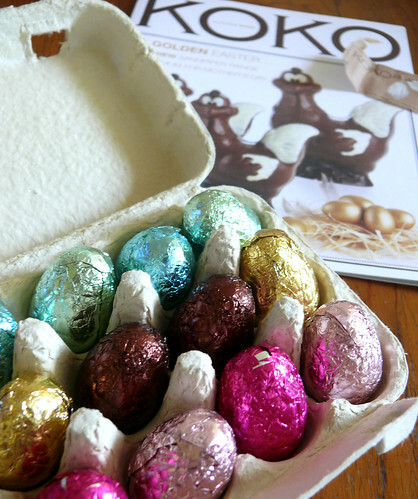 The last time I had chocolate Easter eggs was when we were in New Zealand. I still have a picture of my daughter standing next to a 10 foot tall chocolate Easter bunny taken in a choc factory. Choc Easter eggs aren't found in any supermarkets in KK although Christians are predominant here. It is rather strange while today is a holiday here, the rest of Malaysia (except for Sarawak and Penang?) are working. Same country, different holidays. Louis & Jas were in Melbourne last month for a photo shoot and they met up with my daughter who is back there for her masters degree. It is so kind of them to get these chocs for me, hand- carry them home and keep them to give to me today, Good Friday. Did you know they were going to do this, Yi? 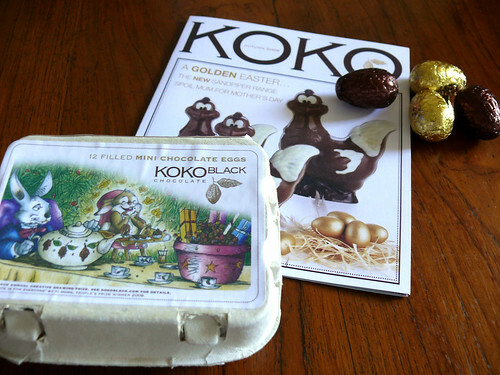 But what's so special about these eggs, other than that they are from Australia's (Melbourne, to be precise) own chocolatier (the other Wonka, Max Brenner, is actually from Israel)? No clue? This carton is special because it features the winning artwork by my daughter last year! Out of 20 pieces of short-listed artwork that were hung at all Koko's branches for passersby to vote on, Yi's piece came out top. If Jesus died on Good Friday, why do Christians say "Happy Easter"? It's because He rose again 3 days later, Easter Monday. He died as a sacrifice for our sins that we may be forgiven. Have a meaningful Easter everyone. This is a slab of smoked pork belly we brought back from Singapore. We reluctantly used the last bit for fried rice (OM, so good!) yesterday. Wey was hoarding it like it was his life. He let go finally when I told him Uncle Clive will bring some in two weeks' time when he visits with his wife and baby. Can hardly wait to show you all the cutie. The baby, not the smoked pork. 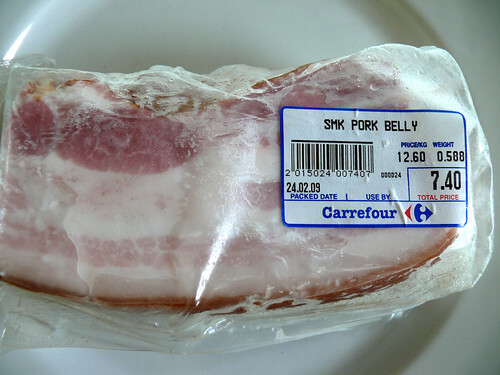 Carrefour's smoked belly pork is way better than their imported bacon (which we also brought back). It is fresh, smooth, not salty and there's no porky stink. It comes uncut so you can cut it thick. Yum. We used most of it to fry rice with (to stretch it) but I was thinking maybe I could try cook with it because it wasn't salty or smoky in flavor. And you know what, it is excellent for stir fry. So good I even ate the fat and rind. My motto is when you eat something sinful, it better be worth it. For the same reason, I use the best butter for home made bread and I spread it real thick. If I eat butter cake, it better be good. Same with any dessert. You can use fresh belly pork in place of the smoked pork. Just chill it so that cutting is easier and add slightly more salt or soy sauce. If you aren't a pork person, then use prawns or chicken or beef sliced thinly. This is not a shy dish, there'll be plenty of oil so I stand guilty of posting yet another oily dish. I personally believe that we need to ingest some fat once in a while. That's my beauty secret, believe it or not. Didn't anyone tell you that after 40 if you choose to keep your body (slim), you loose your face (gaunt). I'm choosing my face (less gaunt, hopefully) over my body (lumpy). *or use chicken cubes, or prawns or beef slices and marinade with salt, white pepper, some sesame oil and cornstarch and water. You can even use pork ribs (marinade too) but you'd have to cook them longer before adding the peppers. 1. Cut the belly pork into 5 cm x 8 cm x 3mm thick slices. Wash the black beans 3x. Taste one to find out how salty it is because different brands have different salt level. Cut the peppers and onion into 2.5 cm pieces. 2. Put the oil into a heated wok and lay the bacon pieces flat. Turn over when lightly browned (use medium heat) and stir when both sides are lightly browned. 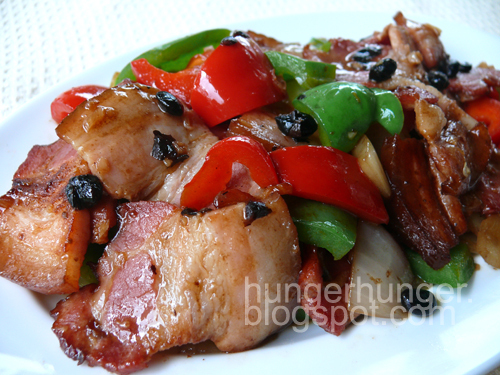 Take the bacon slices out, pour away all the oil and return pork slices back to wok. 3. Add the garlic and black beans and fry for about half minute, then add the peppers and onions, stirring to mix. Turn heat to low, cover and let it cook for about 2 minutes. 4. Remove cover, increase the heat and add the wine. Add the sauce and stir well until sauce has thickened. Give it about 30 seconds so that there won't be a floury taste. If sauce gets too thick, sprinkle in some water. Dish out, eat it hot with rice. Apiwon was my top fav place for Sabah's most famous noodles, ngew chap. 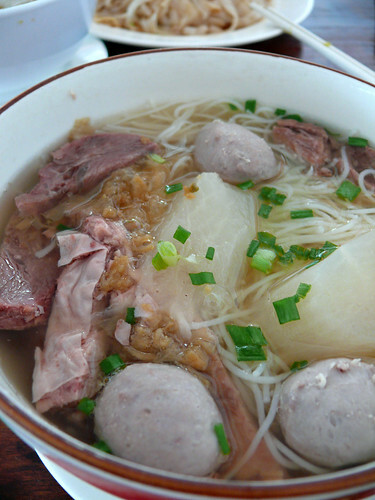 Ngew chap is similar to the Vietnamese pho, but not quite. Instead of thin slices of raw beef, bean sprouts and Thai basil, Sabah ngew chap is less fancy and consists of two types: the darker beef soup noodles where the meat has been stewed for hours with soy sauce and some spices and the other, a soup noodle where there's no color because no soy sauce is used. The non-soy sauce one is more authentic to Sabah and common, the darker ngew chap being a version of the Hong Kong ngoe nam meen. I wonder how many of you remember the 'mobile' ngew chap stall at Victoria Cinema in what is now Wisma Tun Fuad? An old man used to sell ngew chap under the large raintrees (which are still standing). He'd carry his ngew chap in two wooden boxes on a pole across his shoulders, something vendors did a long long time ago. His ngew chap soup was clear, lightly flavored but very delicious. It was very 'ching' or light and refreshing without too much spices. 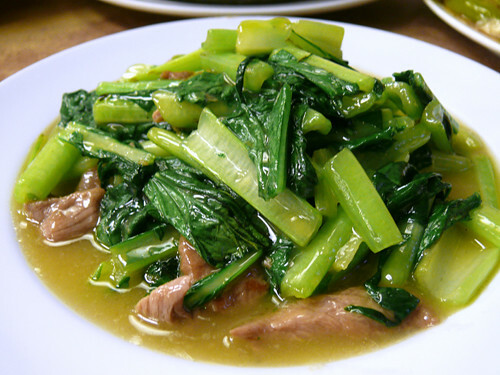 In fact, I only remember the tung choi flavor and the sweet springy meatballs. After the old man passed on, his recipe was gone. Or maybe not, as word has it that Apiwon bought the old man's recipe from his children, including the recipe for making the meatballs. When I first tasted Apiwon's ngew chap, I went mad with joy. It tasted just like the old man's ngew chap! I became a regular at Apiwon, so much so that my kids and Hub wouldn't let me make the final decision on where to eat our Sunday lunches. It wasn't just the taste of the ngew chap that drew me there like it was my second home. The place is everything I wanted in a coffeeshop: it is the cleanest coffee shop in KK, with clean floors devoid of used tissues. Chopsticks and spoons were held in wooden boxes that have lids. The tissues provided were serviettes, not toilet tissue (toilet tissue as napkins is truly truly atrocious, just think about it). They served their noodles in ceramic bowls. Their meatballs were the biggest in town, so that you can bite it into half before chewing it whereas all other meatballs have shrunk to pea-size and you don't even get to bite; you chew straightaway. Their beef meatballs also tasted of beef while all other shops' meatballs taste neutral, bland. Their fish balls too very tasty and springy and smooth. Apiwon also had a tasty, thick chili sauce that I could tell was grounded by a stone mill, not processed by a machine. Other pluses are the shop is located at a corner lot, so that even though it isn't air-conditioned, it is cool. Parking is easy and shaded because of the big trees around and the area isn't jammed with cars. And one of the biggest thing they got right was the bosses were involved in the every day running of the shop. The lady, her hub and their son were nearly always there and their standards were the same day in and out, year in and out except for the unfortunate switch from ceramic bowls to melamine ones sometime last year. When at least two different people told me a few months ago that they weren't impressed with my recommendation of Apiwon, it was like an insult to me, since I love Apiwon's food. Then my daughter came back for a visit last year and Apiwon was one of the first places she headed to. She came back very disappointed. I went one morning after that, and it was very good. Another visit around CNY turned out very disappointing. The last time I ate there was in February, and it was so disappointing too that I've not been back until today. I was hoping that whatever led to the drop in quality had been corrected. Unfortunately, after today's visit, I have to regretfully and reluctantly take Apiwon off my list of places to eat. When I complained, the employee who now seems to run the place (the bosses are never around now) gave me a dour look and said, "Tell the boss!" Well, boss is never around now, that is the problem I think. The star attraction, the beef meatballs, have shrunk in size and number (only 3!) and the stewed beef slices were stingy and thin while the price has gone from RM5 to RM6 to RM6.50 for a regular portion (RM8.00 for large) which by any standard is small. The chili sauce is so watered down that when I dipped my meatball in it, the sauce runs off and doesn't cling to the meatballs. The seafood noodles too suffered similar drop in quality and quantity, with only 2 tiny fishballs, 2 small prawns, 1 slice of fish and 2 slices of fish cake floating in a soup that taste distinctly different because it didn't have the zhou cai /preserved veg anymore. And instead of Emperor's veg, they are now using chinese cabbage. At RM7.50 for a regular portion (RM8.50 for large), I'd be crazy to eat their seafood noodles again. And the ngew chap too. It's been so so hot recently. I wish I am in the northern hemisphere, where "spring has sprung" (lifted that from flickr). Don't you think the world is wonderfully made, when you can live half the year enjoying spring and summer in, say, Australia, and then the next half year in, say, Maine, so you always have nice cool days? But how many people can afford to do that? The perfect weather IMHO (thanks, David) is cool days all the year through, no winter or hot sizzling summer days. I wonder if it's true that Kunming in China has spring weather the whole year through. Lucky. Hub and I don't like eating out, especially lunch. He doesn't like the food outside while I don't like to go out into the hot sun, even if it's a short ride in the car. By the time we park, I'm already exhausted from the sun and glare. Another reason I don't like eating lunch out is because the most common thing served for lunch is noodles. I love soup noodles,but not in 33 C weather. It seems so crazy that we slurp hot soup and noodles in sizzling tropical weather. We should be eating leng mien (cold noodles) like they do in China, Korea and Japan in the summer. A good salad or sandwich isn't easy to find here. Instead we eat piping hot soup noodles meant to be eaten in wintry conditions. I had to whip up something fast (but not instant minute noodles) for lunch yesterday and there wasn't any time to defrost any meat, so I cooked one of my MIL's standby, xia mi chong mien. Xia mi chong mien (dried shrimps spring onions noodles) is one of the simplest and cheapest bowl of noodles (instant noodles notwithstanding) you can cook. Any respectable Chinese kitchen should have ingredients such as dried noodles, dried shrimps and spring onions (I have pots of them in my backyard) so count your kitchen disrespectable if you don't have these 3 items. Unless your mom or granny is Shanghainese, chances are you have never heard or eaten this noodle before. 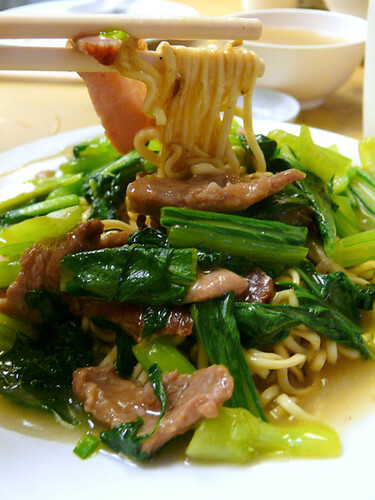 In Shanghai, xia mi chong mien is a popular and humble bowl of comfort noodles. My MIL often makes a large bowl of xia mi topping and keeps it in the fridge for the hungry stomachs that drop by her house unannounced. She just needs to boil some noodles, add the topping and some soup and that's one meal. Her soup can be chicken stock or it can be jiang you tang (soy sauce soup), which is a very common home-style quick soup for pot stickers or wontons or noodles in Shanghai. Just throw a splash of light soy sauce, sesame oil, finely cut spring onions and a dash of msg (optional) into a bowl, add boiling water and that's jiang you tang. Xia mi chong mien is not exactly highly nutritious unless you use a home-made stock so I usually have a side dish of blanched greens. Xia mi chong mien is great when you are tired of being a carnivore. Dried shrimps aren't exactly meat are they? I've had several requests for quick simple meals so this should shut up those who complain that my recipes are 1) complicated 2) costly 3) greasy. Yes, I've been accused of all that. And I haven't even started on my greasy, expensive complicated dishes yet. Like dried oysters wrapped in pig omentum (visceral layer of fat that looks like a piece of netting), something my Dad made once and forever stored in my mind because it was like eating something from an operating room. *choose dried shrimps that aren't too red. The red ones are usually farmed shrimps. 1. Put xia mi into a bowl, pick out any dirt from the xia mi. Wash it 2 times, then add enough water to cover the xia mi and leave it for 20 minutes. Drain and reserve the soaking liquid. 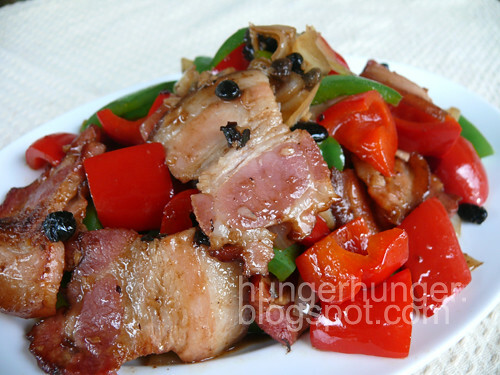 Cut or chop the xia mi until fine, or to your liking. 2. Put oil into a hot wok or frying pan. Add the garlic and dried shrimps and fry over low heat until fragrant and dried, about 5-7 minutes. The longer you fry the xia mi, the better the flavor. The xia mi should be browned and crisped outside. 3. Add the sugar, salt, soy sauce, wine and pepper and continue frying until the shrimps are dry again. Be patient. Now add the spring onions and toss to mix, frying until the spring onions are wilted. Remove into a bowl. You can keep the fried xia mi in the fridge for at least a week. 4. When ready to eat, just boil some noodles, drain and wash off the starch and drain again. Put noodles into serving bowls. 5. Use home-made chicken stock if available, but if not, use Swanson's chicken broth diluted 1 part broth to 1 part water. Add the reserved liquid from soaking the xia mi. When the soup boils, pour enough of the soup into the bowl of noodles to just cover the noodles, top with 2 spoonfuls of fried xia mi. Sprinkle with extra spring onions if like. How good can it be? Try it, especially on kids. 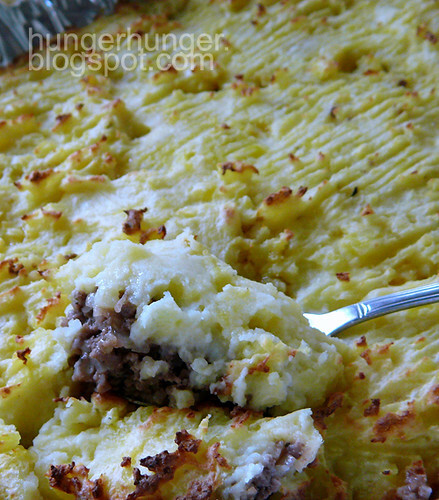 I haven't met a kid who doesn't like cottage pie. 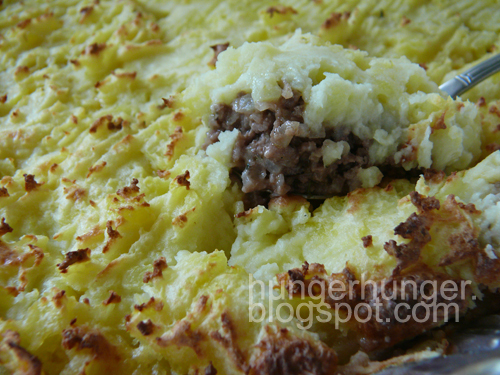 I didn't know until today that shepherd's pies have lamb or mutton as the meat filling while cottage pies have beef. Hmm, I've always called my ground beef mash pies shepherd's pies. There you go, something learnt. I made half a dozen mini cottage pies along with the two jumbo pies for the Kg K kids and when E dropped by this afternoon, I gave her a couple to bring home. She just messaged to say that her hub and son loved the pies and she has to have the recipe, so I am happy to oblige since I am running low on materials to blog. I have the total opposite problem to Jo's. I can write and publish a post in 20 minutes but I don't have enough photos to support my ramblings. These days we've been getting afternoon thunderstorms (and mornings are so hot the sunlight sears) and there just isn't enough natural light to capture photos good enough to blog. You can do the mash the night before to break up the steps and make work lighter. These pies freeze well too although in my house we never have enough left over to freeze. My mash are not super smooth because I don't have a ricer and my helper Vero uses a potato masher. Some people recommend the processor but that would make the mash sticky most of the time. 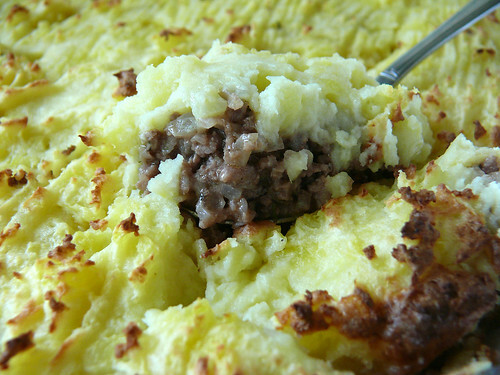 Anyway, for cottage pies I prefer to have some lumps in the mash. This recipe has been with me forever so I can't remember where it's from. It's the only cottage pie recipe I like. In fact, when I eat other cottage pies, I secretly feel pleased that they aren't as good as mine. Now you can secretly feel pleased too next time you eat somebody else's less-than -perfect cottage pie (as long as she doesn't read this blog too). E said most cottage pies have a ragu style filling with too much tomato puree whereas my pie filling tastes more like the beef steak pies. When something's so good you don't want to change it much except I've added parmesan and cheddar in place of butter and also mixed Italian herbs and more garlic to give it extra flavor. Here's the golden recipe. * I like the potato layer to be 1 1/2 times the height of the meat layer for a more substantial meal but you can decrease this amount to 1 kg if you don't want such a thick layer. Make sure the meat layer is not too thin or nobody will like your pie. 1. Peel, cube and boil the potatoes until soft. Drain and mash while hot, adding the cheeses, milk, salt and pepper. I like my mash lightly salted to go with a saltier meat base but it's up to you. Add some butter if like. * My fav is Korean beef granules that come in 300 g and 500 g packs, with the picture of a large piece of uncooked steak on the packs. Very flavorful, better than Oxo and Maggi. 1. Preheat oven at 250 C.
2.Heat a pot up, add 1 T olive oil and fry the onion and garlic until soft (not brown) and add the beef. Fry the beef until the color has changed. Add the puree, basil, oregano or Italian mixed herbs, salt & pepper and flour, stirring all the time. Break the stock cube, taste and season if necessary.If your mash is not too salty, you can make the meat a little saltier. Add 1 1 /4 cup water, stirring well until all the water is absorbed. 3. Spoon beef mixture into an ovenproof dish of about 9" square (you can also use small individual foil pans), arrange the tomato slices over the meat and spread the mash on top. Drag a fork over to make a pattern. You can sprinkle a tablespoon of grated tasty cheddar or parmesan all over the mash too. 4. Bake for 15 to 20 minutes, until mash is crisped and browned here and there. 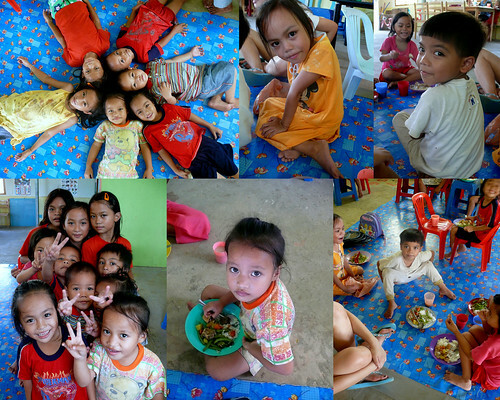 Once every 4 months, it's my turn to provide lunch for about 30 kids of Kg K (let's just keep the place anonymous). My church has adopted this village in Penampang by building a small community hall and employing two wonderful uni students to teach the kids Malay and English daily. The community hall is like an overheated oven and I wouldn't have lasted two days if I were to teach there, so I am really impressed by the two teachers. The residents of Kg K are local Kadazans-Dusuns who are illiterate and because of their ignorance, their kids are not registered with the relevant department and so they can't get their identity cards which means they can't go to government schools. A vicious cycle. There's been some positive results so far and the kids may be getting their ICs soon. Anyway, the church's idea of one nutritious meal a week for those kids below 12 is great, don't you think. Nov 08: I cooked chicken stew, fried french beans and rice, and bought butter cake for dessert. After lunch, the kids and I played a game which my daughter called "Buying the kids' affection." I was just giving them small change for telling me the names of the things in the classroom in English. I think I am most comfortable teaching 3rd graders. They are old enough to interact with, yet young enough to impress. The kids reminded me of the summer I was teacher's aide to my Aunt Lucia, a teacher in Langley, Whidbey Island USA. Those 3rd graders in Langley were the ones who decided I should be called 'Terri' but that's another story for another post. 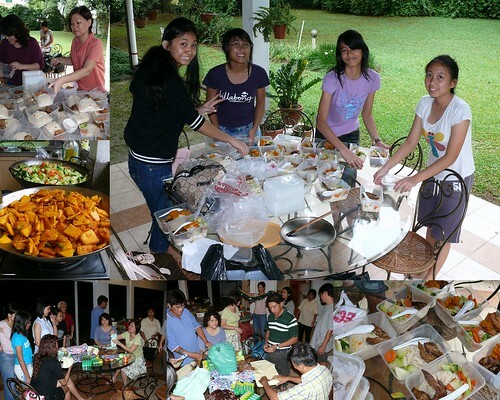 Dec 08: My home group got together to wrap the presents and cook for the Christmas party for the kids. I have a slight fear of going to the kampungs (village) because of the dirt and gravel roads and it seems like every visit ends up with some car getting stuck in the road, even in dry weather. Did I tell you a miracle happened to me when I visited a kampung in the heart of Sabah about 4 years ago? No? That's another post then. 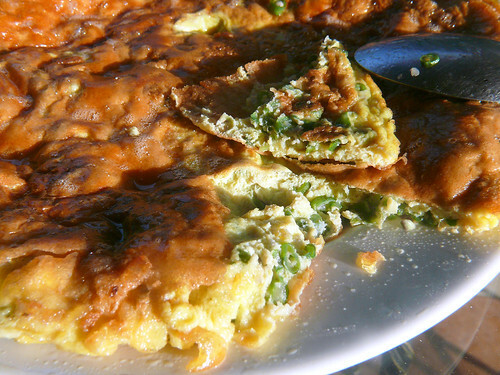 April 1, 09: This morning I made shepherd's pies for the kids, then decided to add homey beans omelettes cooked like a frittata, to go with rice, just in case they didn't like the pie. Dessert is watermelon since it's so hot there. 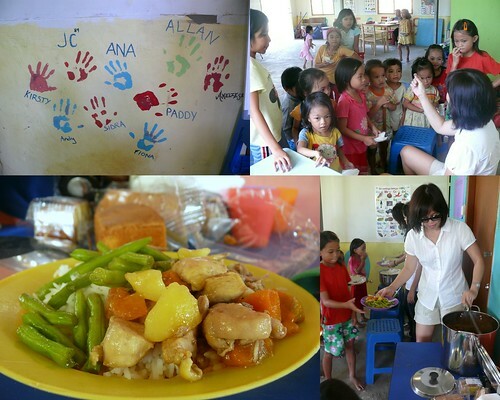 The kids don't eat very much (most are about 5-9 years old) and the first time I cooked for them, I cooked enough for 60 and there was plenty of leftover so some of the kids tried to discreetly pass the food through the school's windows to their parents. It was touching to see that. 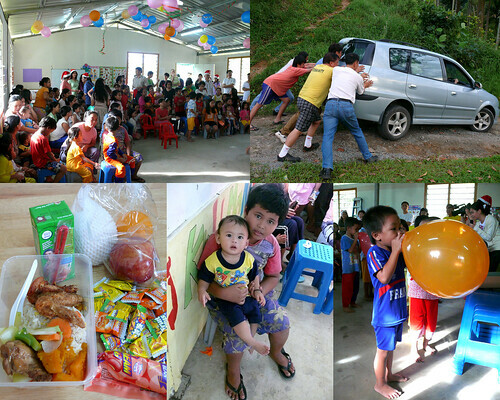 It's time to send the food to the kids at Kg K. This time they'll have to come and carry the food up the hill. Me, I'm heading off to a ladies' brunch after that. Remember, don't sweat the small stuff, really, give thanks for all that God has provided!Have a great day everybody! p.s. I'm told the pie was a big hit.